What is Supernatural Lacquer Subscription Box? 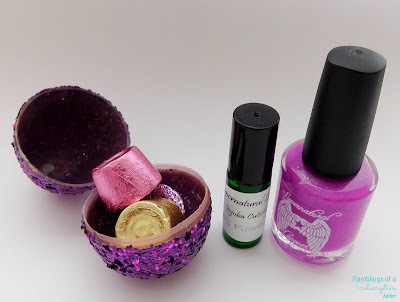 : Supernatural Lacquer's Subscription Box is a bimonthly box which will include an exclusive nail polish, a nail related miniature, and a seasonal/holiday extra! 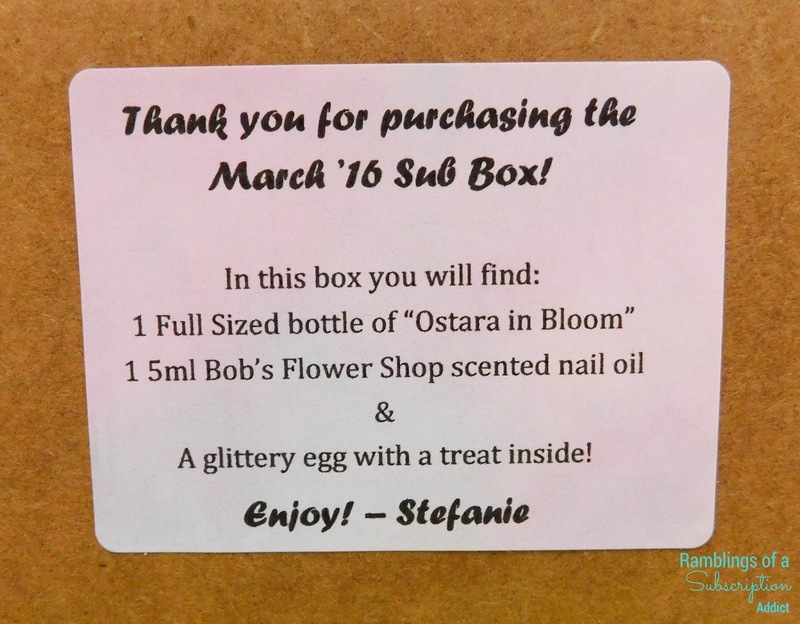 Instead of being a subscription where you sign up and it auto-deducts, this is a preorder box. Join the Facebook Group to stay up to date! How Much is Supernatural Lacquer Subscription Box? : The box is $13 shipped to the US, $19.50 to Canada, and $24.50 elsewhere international. 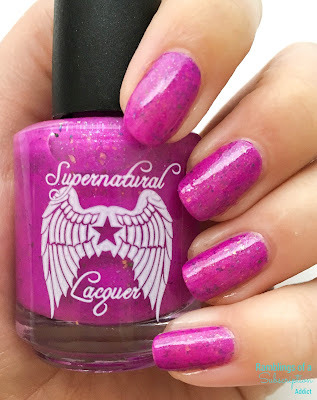 In case you don't know yet, Supernatural Lacquer is a nail polish brand that draws inspiration from the show Supernatural and supernatural things. The exclusive polish for March is Ostara in Bloom. 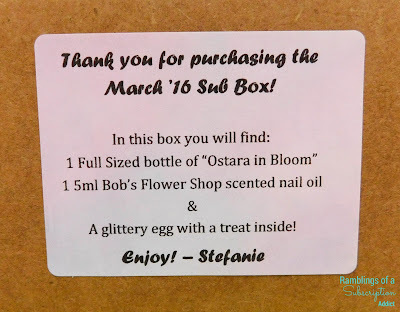 I'm not going to get into too many specifics, you're free to do your own Google searches, but I will tell you that Ostara is the Pagan celebration which coincides with the time Easter is celebrated. Instead of a typical information card, the information is printed on a sticker and stuck in the box. I love this idea and I'm always a fan of information cards/stickers, in any form! Check out this polish!! 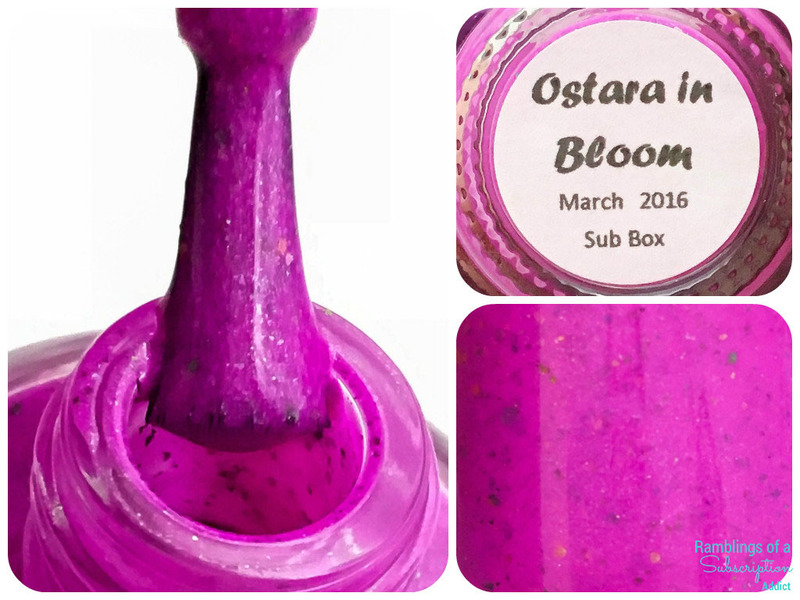 Ostara in Bloom is such a wonderful deeper pink that leans slightly purple with tons of flakes and small holographic glitters. As soon as I applied, I saw how amazing it looked just straight out of the bottle. This is two thinner coats, no top coat. It dries to a slight silky finish (not quite matte, not quite gloss), and the flakes pick up just a little bit of light. With a glossy top coat, you can definitely see the bits of holographic glitters easily. Ostara in Bloom is actually a fully opaque with just one coat, and it's one of the best formulas I've tried. It went on so smoothly and would be an awesome base to nail art (if I were talented in that). Extras! 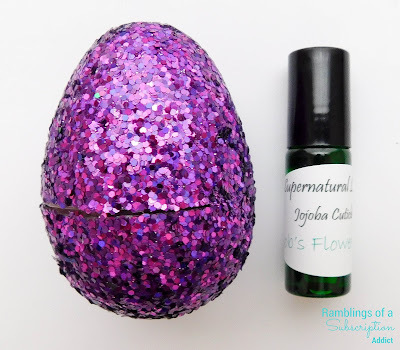 I am so in love with this glitter egg! I actually asked the maker where she got these eggs from because I need a whole basket of them. There was chocolate in the egg, seen below. The nail related extra is Jojoba Cuticle Oil in Bob's Flower Shop scent. It smells sooooooo good and springy, and it came in a rollerball! 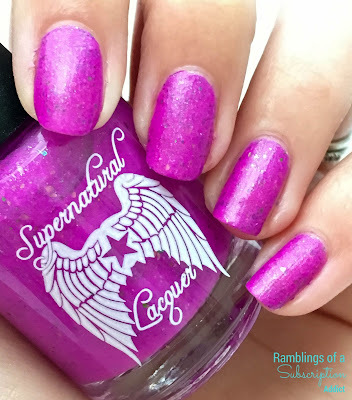 Overall, the first box from Supernatural Lacquer was just perfect. I love the polish and her formula is just amazing, and it was such a great polish for the first box. I actually already have the May box waiting for me to play with, and it's definitely worth it! Make sure to join the Facebook Group to stay up to date with the box releases as well as all of her gorgeous polishes!